Born in Allegheny City, Pennsylvania, Cassatt was a daughter of Robert Cassatt, the founder of Cook & Cassatt, a mercantile shipping company. She developed a cosmopolitan outlook early in life, having spent part of her childhood in France and Germany. Between 1860 and 1865, she studied intermittently at the Pennsylvania Academy of the Fine Arts in Philadelphia, where she developed her skills as a draftsman and figure painter under the tutelage of Christian Schussele and Peter Rothermel. In December 1865 she sailed to Paris, going on to study with the French painter, Charles Chaplin, and Jean-Léon Gérôme, a leading academic realist. Cassatt also made copies of Old Master paintings in the Louvre. During 1867–68, she spent time in the art colonies at Courances and Ecouen, where she worked under the genre painters Pierre Frère and Paul Soyer. In 1868, Cassatt made her debut at the Paris Salon, exhibiting an oil titled Mandolin Player (1868; private collection), a portrait of an Italian girl painted with a somber palette. From May 1868 until 1869, Cassatt continued her formal training under Thomas Couture in the village of Villiers-le-Bel, not far from Ecouen. Inspired by the “new painting,” Cassatt abandoned her former academic approach and adopted the high-keyed hues and modern subjects of Impressionism. However, like Degas (who became her friend and mentor) and Manet, she eschewed the dissolution of form associated with the orthodox Impressionism of Monet, retaining, instead, a solid rendering of the human form. Her impressionist work was also informed by the pictorial concerns of Japanese art, as evident by her use of bird’s eye perspectives, asymmetrical designs, and flat color areas. Cassatt went on to participate in the fourth impressionist exhibition of 1879, displaying twelve works, among them her well-known Lydia in a Loge, Wearing a Pearl Necklace (1879; Philadelphia Museum of Art). She exhibited with the impressionists again in 1880, 1881, and 1886. Her link with radical French art was given further affirmation in 1881, when Paul Durand-Ruel, the influential Parisian dealer who promoted French Impressionism, began purchasing her work. Cassatt remained a prolific artist until 1911, when, depressed by the death of her brother, Gardner, she took a two-year hiatus from her work. After a brief period of productivity during 1913–14, during which time she created a number of pastels that she presented to Durand-Ruel, she was afflicted with cataracts. In the ensuing years, Cassatt lost much of her vision and was unable to work at all. 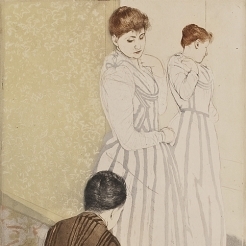 However, she continued to fraternize with fellow artists, dealers such as Durand-Ruel, and collectors such as Havemeyer, supporting the latter in her efforts to promote women’s suffrage by participating in the Suffragette Loan Exhibition of Old Masters and Works by Edgar Degas and Mary Cassatt held at Knoedler and Company in New York in 1915. Cassatt divided her time between Paris, Beaufresne, and a villa in Grasse until her death on June 14, 1926. She was initially better known in France than in the United States. 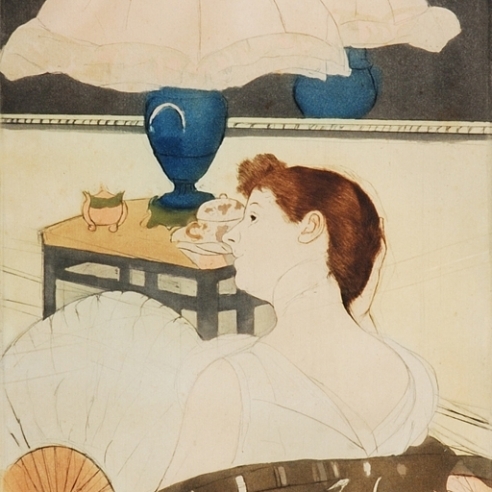 However, by the early twentieth century, Cassatt was acknowledged as one of America’s leading artists: a talented and very determined woman who, as a scion of one of Philadelphia’s most prominent families, preferred “art ... to the social life open to her” (Philadelphia Inquirer, June 16, 1926, p. 1, as quoted in Suzanne G. Lindsay, Mary Cassatt and Philadelphia, exhib. cat. [Philadelphia: Philadelphia Museum of Art, 1985], p. 7).